“When We Were Young” music video now online! Surprise! 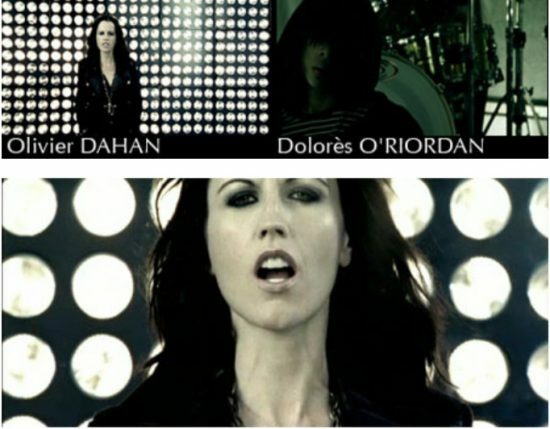 Dolores O’Riordan has already filmed the video for “When We Were Young” with longtime collaborator Olivier Dahan and it’s online now for viewing. Big thanks to Maxence for the tip. UPDATE: We just spoke with a rep at the LA House of Blues and she said the band is trying to reschedule (yay!) possibly sometime in November, but more word will not come until midday Monday at the earliest. If we hear anything more we’ll share! Promotional CDs for the new single “When We Were Young” have started being sent out to radio stations. “When We Were Young” is the second single from Are You Listening? Q) With all of the bands getting back together like The Police and The Spice Girls, which one are you most excited for? A) The Police, we’re going. We’re going to the New York show and we were trying to get tickets. This has been the big talk of the band and crew for the past couple of months is how we’re going to get Police tickets because they all sold out instantly. We finally got our hands on Police tickets and Terry just went and said it was incredible and he wants to go again. I think Tim is going this weekend so everybody, I think, has jumped on and everyone’s found their own way to get to The Police. That’s the one that everyone’s been talking about. Q) Are there any other ones that you saw? A) Actually, last night I went and saw, let me try to say her name right – Dolores O’Riordan from The Cranberries and it was awesome. She’s incredible! I loved The Cranberries and I was way too young to go really see them and they didn’t come to our town. It was really cool to see her, but I really like her new music. It’s really cool! It’s strange and it gets really heavy sometimes, but it’s very sincere and I think she’s awesome. So, I don’t know if you call that reuniting, because it’s not that, but it’s kind of the same thing. I thought she was incredible. Fans have been worried whether tonight’s concert (and indeed, further shows) would be canceled due to Graham Hopkins’s medical issue that canceled last night’s concert in Los Angeles. 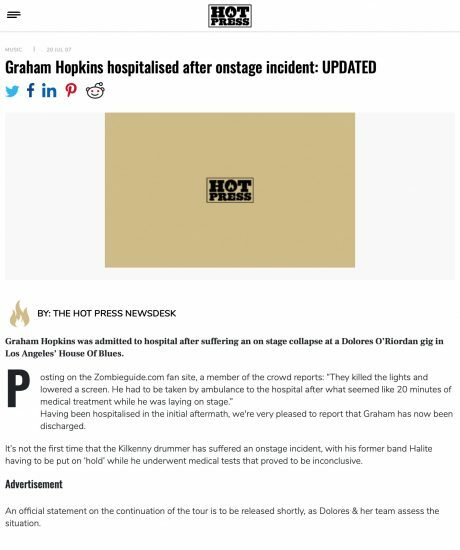 Ireland’s Hot Press reports that Graham was discharged from the hospital earlier today. I just got back. I seriously thought the drummer (Graham Hopkins, I think) was going to die. It was not a pretty sight and it was not a fun night…I hope he makes a full recovery. There is no replacement drummer. Refunds will be issued at the point of purchase (yes for LA too as she only got through about 3-4 songs). The rest of the tour is CANCELLED (not postponed) and an announcement to that effect will be made tomorrow. The drummer had a seizure right on stage. They killed the lights and lowered a screen. He had to be taken by ambulance to the hospital after what seemed like 20 minutes of medical treatment while he was laying on stage. To let everyone know, my wife and I were there at the concert in LA tonight. To clarify the account posted on Perez Hilton’s site, Dolores wasn’t screaming, she was calmly asking for the lights to be turned down and then an ambulance. There was no chaos, and we didn’t see any police, only the ambulance she asked for. Sunset was not shut down either. I applaud everyone at the event for handling the situation as best they could, there was never a threat to ours or anyone’s safety. The Perez Hilton comment posted is totally blown out of proportion. We hope and pray the drummer is ok, by the way his name is Graham Hopkins and he is a renowned Irish drummer who has played with many bands in the past. In light of the news that the rest of the tour is probably cancelled, we wish the band the best and look forward to their next visit in LA, which hopefully is in the near future. For those that haven’t had a chance to meet him, Graham is a wonderful and all-around awesome guy, and we hope he gets better as soon as possible. Speaking of tours, we want to take a second to once again recommend Felipe’s site Cranberries Shows, where you can find lots of useful stuff like past setlists and tour photos. If you have setlists, merchandise photos, or ticket scans from the current tour, send it to Felipe! 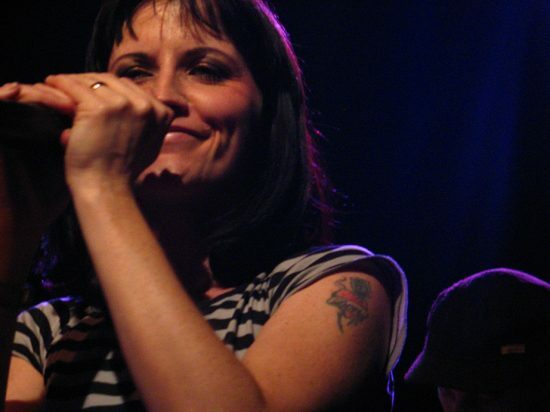 A dental injury has canceled Dolores O’Riordan’s planned show at the 9:30 Club in Washington, DC tonight. A member of the crew told Zombieguide that Dolores broke her front tooth on a Japanese rice cracker at dinner. She did not show up for the 5:00 PM soundcheck as planned, and evidently never left her tour bus. 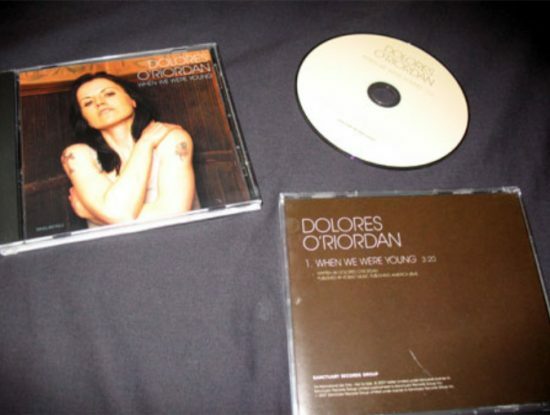 Concert goers saw crew returning Dolores’s clothes and personal effects to the tour bus after 7:30. Staff members for the 9:30 Club announced the cancellation around 8:00 (first announced as a postponement, later changed to a cancellation). It is currently unknown if Dolores will perform tomorrow night’s scheduled Philadelphia show. Crew members were preparing for the trip to Philadelphia, but did not know if it would occur as scheduled. Fans who bought tickets will receive full refunds from their place of purchase through July 27th according to verbal announcements at the show and a post on the 9:30 Club website. Major online ticket vendors such as Ticketmaster should refund automatically. We wish the best for Dolores and hope she gets fixed up soon!